Looking out over Africa from Barafu High Camp on Kilimanjaro. 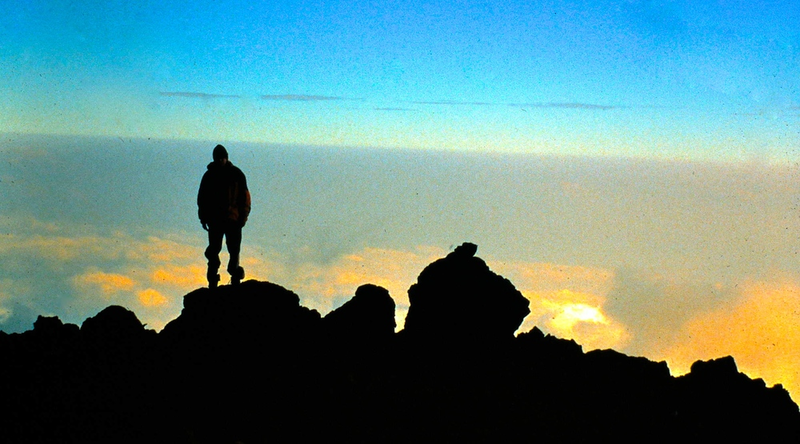 Kilimanjaro lies on the Kenya-Tanzania border and at 19,340 feet is highest point in Africa. Kili is the remnant of an ancient and much larger super-volcano that collapsed into itself and is now a gargantuan pile of rubble with fifteen separate glaciers on top, the legendary 'snows of Kilimanjaro'. This was a particularly special trip because it was the introduction of my son Michael, who had just turned 13, to the big mountains of the world. As climbs go, Kili is mostly a long, tedious, very scenic, uphill hike. It's starts out in an tropical jungle and passes through every variation of climate zone on earth up to arctic/polar at the summit. It's five days up on the Machame Route, far from the tourists on the other side of the mountain. The shot at left/above has become the money shot from the trip. Shortly before turning in at Barafu high camp (about 16,000 feet) on the eve of our summit climb, Mike wandered over to the edge of a drop-off to survey the sunset. How often does a 13-year-old kid get to look out across central Africa from above the clouds?